Turin, or Torino airport, Caselle Aeroporto Internazionale di Torino, is 16 km (10 miles) north of the city center. The airport opened in the 1950s and was most recently renovated in preparation for the 2006 Winter Olympics. Modernization included terminal expansion, a modern boarding lounge, a bus lot, and additional boarding gates. 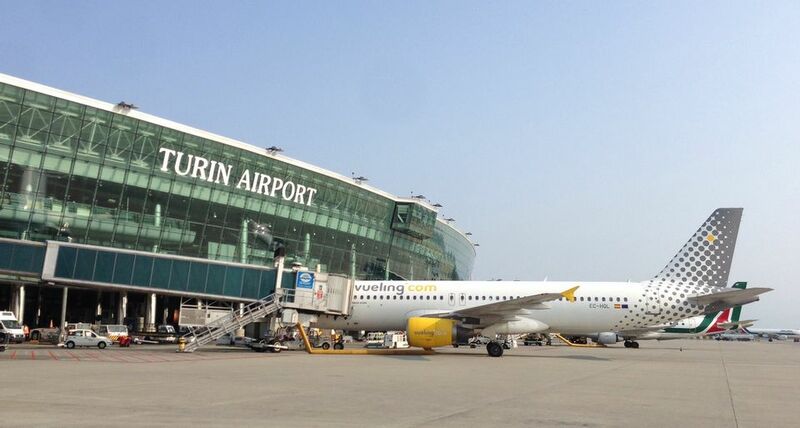 It is now possible to fly into Turin's airport from many European countries as well as other Italian cities. While Turin airport is much smaller than Milan Malpensa Airport located 140 km away, it's also an easy alternative for regional flights to and from destinations in Europe and Italy, and a good jumping-off point for trips to northern Italy, the South of France and western Switzerland. Some of the larger airlines serving Turin airport include Alitalia, AirFrance, British Airways, EasyJet, RyanAir, and Vueling. Express Rail Service: The railway station is located very near the air terminal. Rail service between the air terminal and GTT Dora Station in northwestern Turin takes 19 minutes, also stopping at Madonna di Campagna. Departures to and from the airport begin around 5 AM. The last train for the airport leaves at about 11 PM, while the last train from the airport departs at 9 PM, in all cases to coincide with scheduled flights. Purchase your train ticket at the ticket office in the Arrivals terminal. You can buy a full-day ticket that can be used on public transport in Turin as well. Bus Service:: Bus service between downtown and the Turin airport has several stops en route to the Porta Nuova main railway station including Porta Susa railway station. The bus leaves and arrives at Porta Nuova at the corner of Corso Vittorio Emanuele II and Via Sacchi. The bus leaves Porta Nuova Station every 30 minutes during peak hours or 45 minutes at other times, from about 5:15 AM to 11:30 PM. Buy your ticket from a bar near the bus terminal. From the airport, the bus leaves on the arrivals level just in front of the exit. There are ticket machines inside or you can buy them at the tourist office or the newsstand in the departure lounge. The bus service runs from about 6 AM to midnight. Taxi: The taxi rank is located on the left at the exit of the Arrivals level. Car Rental: Car rental offices are located in the arrivals level near the exit. We have found the most competitive pricing and comprehensive options by booking in advance (before leaving your country of origin) with Auto Europe. Note: If you're staying in Turin's city center, a rental car is not recommended since there is good public transportation and driving and parking are restricted and often difficult in the center. Travelers from the United States may arrive at Milan's Malpensa Airport, the large international airport north of Milan. From the airport, there is a bus to Milan's main train station. From there a train to Turin will take about 1 1/2 hours. Milan's Linate airport also has flights to and from Europe. For more airports see our Italy Airports Map.